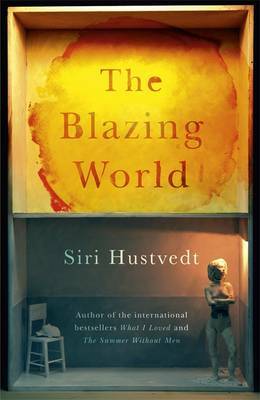 Where to start with Siri Hustvedt’s new novel? Perhaps with a warning that it’s not an easy read. If it’s good old linear narrative you’re after best look elsewhere. The Blazing World is made up of a collection of documents relating to Harriet Burden – interviews; written statements from her friend, her lover and her children; memoir fragments; excerpts from her journals labelled alphabetically although not chronologically; articles from art journals – all collated by I. V. Hess who introduces the book. From the start Hess warns us that Harriet is a self-confessed trickster, telling us that she had shown her installations pseudonymously, hiding behind three male ‘masks’ while planning to reveal her female identity to the resolutely masculine New York art world once the exhibitions were over. An artist whose work had received barely any recognition, Harriet was the wife of a highly respected international art dealer, quietly hosting his dinner parties while inwardly seething at male complacency and feeding her voracious appetite for knowledge. When Felix drops dead one morning, Harriet suffers a severe breakdown until one day her therapist tells her it’s time to begin a new life and she hatches a plan. However, as plans so often do, things go awry: her third mask refuses to play ball, claiming the work as entirely his own. That’s a very short, very simple summing up of what is an intensely cerebral, complex and challenging novel. It’s likely to have you googling frantically, wrestling with Kierkegaardian philosophy and tracking down details of Margaret Cavendish – Harriet’s seventeenth century alter ego, as Hess helpfully tells us in his introduction, and the author of the original The Blazing World. Harriet’s apparently limitless knowledge proves irksome to many more ignorant denizens of the art world who smile, nod and change the subject – and at times, I must admit, I found myself in sympathy with them. That said, this is an extraordinary piece of work, astonishing in its erudition. Hustvedt’s descriptions of Harriet’s art are as vivid as I remember from What I Loved, one of my favourite novels. The documents that make up the book are written in many disparate voices, some of which work better than others – I particularly liked Phineas Q Eldridge, the gay black performance artist who is her second male mask, and the contributions from puffed up art critic Oswald Case were very funny. There are as many themes running through the book as there are voices, from feminism to aesthetic perception, identity to sexual ambiguity. It’s bursting with ideas. Shortly after starting The Blazing World I was reminded of Nat Tate – William Boyd’s spoof biography of a young artist, long dead, published by David Bowie which was launched in New York back in 1998. I remembered reading what the Oswald Cases had to say about how influential Tate’s work had been before the secret was revealed to them and chortling to myself. Siri Hustvedt has taken a similar idea and worked it into an extraordinary novel – fascinating and deeply ironic. Of course, shortly after I thought of the Nat Tate shenanigans I came across it in her book. There’s very little this woman doesn’t know. This entry was posted in Reviews and tagged American fiction, Art, Books, kierkegaard, Lady Margaret Cavendish, Sceptre Books, Siri Hustvedt, The Blazing World on 27 March 2014 by Susan Osborne. I’ve never ‘got on’ with Siri ….but this sounds v interesting . Maybe I need to give her another go …. As long as you take note of the health warning, Helen. It’s a stupendous piece of work but at times I felt the need to lie down in a darkened room! Great review – It is a challenging read but so worthwhile as it is a fascinating story and it gets you thinking about so many different concepts & great thinkers. I think she wasn’t always supposed to be a very sympathetic character. I mean, can you imagine how exhausting it would be to know her in person? I would love to talk to her but probably only for ten minutes. But she’s ridiculously intelligent and passionate so fascinting to read about. I actually liked the sections by her psychoanalyst friend the best because I loved her thoughts about personality and felt like she was probably giving the most honest portrayal of Harriet. Thanks so much, Eric. Not an easy book to review! I liked Rachel, too – she was a quiet sane voice, much needed at times. I’m glad you enjoyed the book. I wondered how long it had taken her to write it. I’m sure it’s been percolating away for some time. Must look up a few interviews. I’ve never quite got into her work either, but I’m enjoying reading the reviews. Not sure I am quite ready for this yet. No, I think this one’s for those of us who are already converted, Claire. I’m a huge fan of What I Loved but perhaps you’ve already tried it. The only book of hers that I’ve read is ‘The Summer without Men’, which i enjoyed but wouldn’t have said was a great piece of work. This interests me because I’m always interested in anything that plays around with the expected narrative form. But, I think I have too much else on at the moment to be able to commit to reading it. Maybe when it comes out in paperback. I think that’s a good idea, Alex. It demands your full attention and so needs to be read when you have enough time to give it that. Oddly enough, I wasn’t so keen on The Summer without Men – my absolute favourite is What I Loved. Definitely adding this to the list of books I’ll be buying come pay day! Wonderfully interesting review. Thanks so much, Alice. I’m a huge fan but you may have guessed that already! I haven’t read any of Hustvedt’s other books, but I’m minded to read this one at some point. Your review is very intriguing! Impossible to sum this book up, Jacqui. If you wanted an easier way into her work I’d start with What I Loved, still my favourite Hustvedt novel. Such an incredible talent – it would be wonderful if she won the Man Booker.